The benefits of massage therapy in the workplace are expanding every day. Major corporations such as Motorola and BP Amoco have made massage a part of their employee benefits programs, and you can too! My name is W. Scott Lawler. I am a member of the American Massage Therapy Association and Certified under the state of California. I have been practicing my profession for many years. 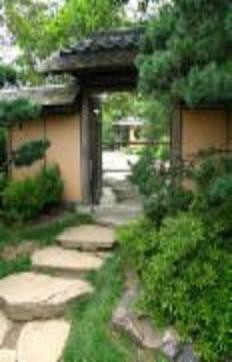 I am a graduate from the American Institute of Natural Healing (AINH) in Antioch, CA. On-site 15 minute seated chair massage, $15 per employee. On-site 15 minute seated chair massage, $5 paid by employee, $10 paid by company. On-site 15 minute seated chair massage, $10paid by employee, $5 paid by company. Certificates redeemable for off-site massage – you set the value. Certificates can be redeemed by employees for full body or seated chair massage. Your company can pay for entire service or use the program as a percentage off of the actual rates. I would be happy to work with you in developing a monthly or quarterly program to fit the needs of your benefit plan budgets and your employees. I will call you within the next week to answer any questions you may have. I would be happy to meet with you to set up a program. Why provide chair massage to employees? Our healthy economy means that these days the most valuable workers can take their pick of excellent jobs. Many organizations therefore face a stiff challenge attracting and keeping good employees. Workplace chair massage programs help to increase job satisfaction and create a caring environment that employees really appreciate, and workplace chair massage is much less expensive than many employee benefits a company can offer. 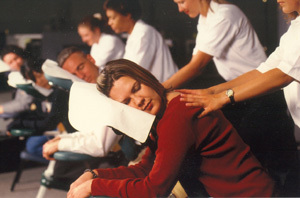 A chair massage program can even help attract skilled workers in the first place. In one recent article, IT manager Glen Gracia said that one of the things that drew him to apply at Rourke was their policy to provide employees with an allowance for relaxing activities such as workplace chair massage. Stress-related employee turnover, absenteeism and waning morale all affect the bottom line. Job stress and related problems cost companies an estimated $200 billion or more annually, based on information from the American Institute of Stress and the American Psychological Association. Workplace chair massage can help your team get through a demanding time or reward them for their extra effort. A number of our customers use chair massage to relieve the stress of restructuring , moving, budget season, or other hectic times of the year. Onsite chair massage can significantly improve employee problem solving abilities . A recent study in American Psychologist gave one group of workers a 15 minute rest, and another, a 15 minute massage. The group that received the massage performed significantly better on complicated tasks like math problems. Workplace Chair Massage also improves creative thinking and relieves fatigue . It's better than a cup of coffee! Corporate chair massage can help keep your employees healthy as well as happy. Massage has been shown to reduce blood pressure , relieve arthritis, improve joint and muscle aches especially in painful areas of the neck and back, and even increase immunity to colds and flu ! In addition, workplace chair massage can play a very important role is preventing and treating the pain and numbness associated with excessive keyboard and mouse use .